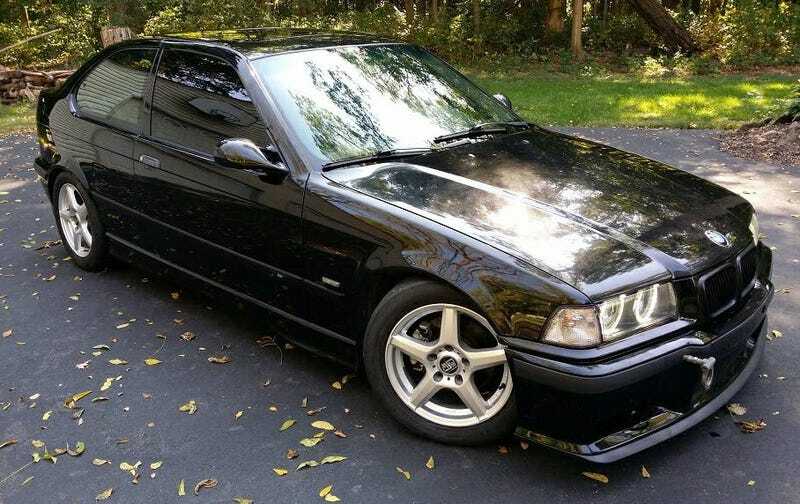 For $6,499, Could This Supercharged 1997 BMW 318ti Handle The Pressure? If you have one of those shirts that says “Injection is Nice, But I’d Rather Be Blown” then today’s Nice Price or Crack Pipe Bimmer might just be right up your alley. That is, if its price doesn’t first blow it. Do you need a caddy if you don’t play golf? I’d say hell yes, we all need someone to follow us closely behind and offer sage advice on how things lie and what actions one should take. I also think that everyone needs a Caddy—as in Volkswagen Rabbit pickup—in their lives. Of course, seeing as there’s a finite number of those that’s not always possible and hence cars like yesterday’s 2005 VW Jetta with its Smyth pickup body are available to fill the void. Not too many people were interested in what it costs to have that particular one fill their void (ouch!) and it fell in a decisive 78% Crack Pipe loss. From one German car that has been visually altered to another with a more stealthy mod—today we’re considering this 1997 BMW 318ti that has been imbued with, among other things, a Downing Atlanta Supercharger. The DASC was produced by the Georgia-based company for a number of years but is no longer among their offerings. It’s a bit of a unicorn and the one on this 318 is said to have been rebuilt prior to its adoption. Along with the blower on its 1.9-litre M44, this hot hatch comes with an M-style bodykit, a five-speed stick, 3.73 LSD, and a buttload (that’s a real measurement, btw) of other upgrades that are sure to give you some pressure in your pants. The seller quite succinctly details them all in the ad so I won’t belabor them here. Aesthetically, well if you like the way the E36/5 compact looks then you’ll love this one because the M additions and black paint really make it look sweet. If you’ve always thought the car looks like one of the three blind mice post-farmer’s wife, well then this isn’t going to change your mind. Regardless, you might want to change out the MSW wheels for something more in the BMW family. The interior seems to be well kept for too. The leather sport seats seem intact, as does the dash and door cards. Those seats sit under what’s described as a “custom alcantara headliner” and in front of an aluminum pedal set. Extra gauges populate the center console keeping tabs on the supercharger and sit in front of a “weighted” Momo shift knob. Overall it seemingly presents well in the ad, which is pretty impressive considering the substantial 213,394 miles the car shows on the clock. What’s not to like here? Well, the seller says there’s some bubbling in the paint on the rear wheel wells. He also says that the rear sub-frame and undercarriage have been treated to a dose of POR15 to “prevent any future corrosion.” I’d like to know more about any past corrosion that led to the POR15-ing before I laid down any cash for the car. That getting laid requires a requested $6,499. If you consider that the DASC alone is probably worth half that (remember, they aren’t making those any more) then that’s an asking that might be worthy of a response. It’s now time for you to give that response. What do you think, is this tastefully modded and seemingly well-maintained 318ti worth $6,499? Or, is that a price that will likely blow up in the seller’s face?